Is Oculus the new VR gaming heavyweight? It was just two months ago when Oculus Rift passed HTC Vive as the most popular VR headset in the Steam hardware survey for the very first time. According to the latest data, this wasn't just a fluke. In February, Oculus overtook HTC Vive by 1.9%, with 47.3% of Steam users connecting with Oculus Rift compared to 45.4% with Vive. Now the March numbers are out, and it appears that Oculus’ growth over Vive could be a trend: the gap has grown ever-so-slightly to 48.9% versus 44%. These numbers come from Valve’s opt-in Steam Hardware & Software Survey, which collects data on everything from which video cards and processors gamers use to which VR headsets they're wearing while gaming. Because the survey is voluntary, we can’t know for certain if more Steam gamers are on Rift headsets than Vives. But the bigger the gap gets, the more likely it is that Oculus is winning at attracting more gamers. This is a major accomplishment for Oculus, considering HTC has handily dominated the Steam market for some time. When the HTC Vive released in early 2016, it quickly became the favorite device for Steam users to play in VR. Around the same time, Oculus updated from the DK2 to the current Rift model. But by mid-2016, only about 30% of Steam VR users had chosen Rift, versus 60% using the Vive, according to the survey. What's this a sign of? While the data looks good for Oculus in terms of sales, it neither proves that Rift has begun to outsell the Vive, nor that the Vive ever outsold the Rift to begin with. Because Oculus users access the Oculus Store by default and must manually download the SteamVR browser, many Oculus gamers simply never open Steam. If only half of Oculus gamers try Steam, compared to all Vive gamers, then Oculus may have overcome a significant handicap to beat HTC at its own game. On the other hand, these numbers could also mean that Oculus users aren’t satisfied with what the Oculus Store has to offer and are migrating to Steam to find better content. Or, considering Steam's data shows percentages instead of hard numbers, it could be that Vive users have stopped using their headsets to game, rather than that more people are using Rifts. There are too many uncertainties to know the primary factor behind Oculus' sudden growth. Neither Facebook, which owns Oculs, nor HTC have made their headset sales public, so we can only speculate. Could the new Vive Pro help HTC dominate Steam again? With the HTC Vive Pro release date in just a couple of days, HTC no doubt hopes it can put a dent in the trend. But considering the HTC Vive Pro price is $799 / £799 or around AU$1,045, that may be too much for a lot of gamers. On the other hand, Oculus is focusing its current efforts on the Oculus Go, which won’t likely have any Steam support. 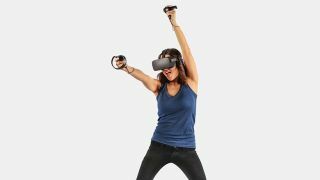 If Oculus customers choose to go cordless at the expense of graphics, the Rift's trending success could slow down as the year goes on. Meanwhile, Windows Mixed Reality, which doubled its Steam market share from December to January, has continued to grow steadily but appears to have leveled out somewhat around 5%. Like Oculus, it doesn’t let users use Steam by default, so the survey could actually be deflating Windows’ growing VR market presence.